... I ate my first garden grown strawberry of 2011. Really, try growing them. They are *so* easy to grow and garden strawberries are like 1000 times more delicious than grocery store strawberries. I kid you not. ... the peonies are blooming and I am enjoying them while I can. In this heat they won't last long. ... I plan to have a cool drink and relax so I can (finally) get over this head cold. The Dala Horse, or Dalahäst, is a traditional toy from Sweden. They are carved from wood and beautifully decorated using the swedish painting technique called Kurbits painting. The oldest ones, some of which can be seen here, date back as early as 1624. The Viking's religion, As, viewed the horse as sacred, which is probably why horses were carved. There is a whole lot of information on the Dala Horses and their history at the Grannas website. Grannas, the oldest existing manufacturer of Dala horses, was started back in 1922 by Grannas Anders Olsson. It is still family owned and the horses are hand-carved and hand painted. You can see pictures of all the production step here. And what about those Dala Horses at the top of the page? Those live with us. The red one is Maddie's and is newer. The Blue one is Pete's, which I believe he got as a child (am I right, Pete?) The black one is very special -- it's rather old and was given to Maddie as a special gift from her Farfar (Father's father in Swedish) shortly before he died. And those little ones are Pete's -- I think they are also kind of old. Can you believe it -- I don't have one to call my own yet! Picture of the Giant Dala Horse at the Scandinavian Heritage Visitors Center in Minot, ND. Hope you found this interesting! Even though I only have a touch of Norwegian in my blood, I am so taken with everything Swedish! I'll post more about Swedish crafts in the future! 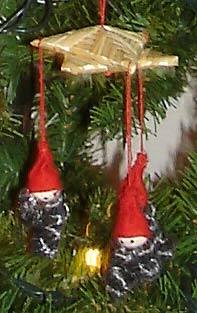 The straw ornaments are very traditional, as are the tomte's hanging from it. 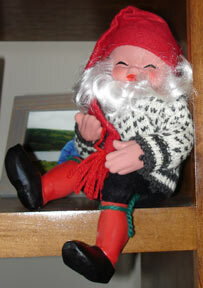 Don't know what a tomte or tomten is? See my post from last December. Pretty cool, huh? 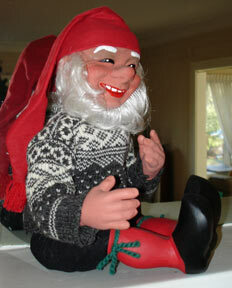 And more Swedish Christmas info will follow. 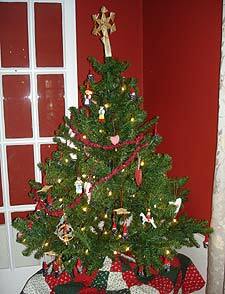 I'm having the traditional Swedish Christmas dinner for all of Pete's family at my house this year, so I'll be sure to blog about that too! And if you want to read more on your own, Pete's Mom got me the book Swedish Christmas by Catarina Lundgren Astrom a few years ago. 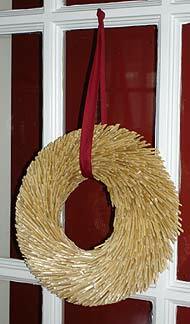 It has a lot of recipes for Swedish holiday goodies as well as some info on the traditions. And I'm collecting info on Dala Horses too! More on that soon!